Los Angeles City Hall. Photo by John Schreiber. 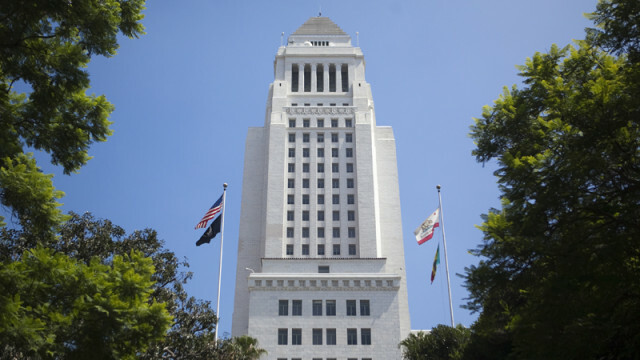 The Los Angeles City Council is set to consider a resolution Friday that would declare Los Angeles a “city of sanctuary” for immigrants, although it would be non-binding and not change any city laws. The resolution was passed by the Immigrant Affairs, Civil Rights, & Equity Committee more than a year ago and would represent “a declaratory statement of our values, of our vision, of our commitments,” City Councilman Gil Cedillo told City News Service when he first introduced the resolution in September 2017 with Council President Herb Wesson. While there is no legal definition of a sanctuary city, it generally applies to municipalities that limit cooperation with federal authorities on immigration enforcement. Embracing the term has become a way for cities to defy President Donald Trump, who has tried to cut off some federal funding to sanctuary cities. The Los Angeles Police Department has had a longstanding policy of not initiating contact with individuals based solely on their immigration status and does not give immigration agents access to its jails or inmates unless they have a federal warrant. Because of those policies, Los Angeles is often referred to as a sanctuary city, though it has never officially embraced the term as other cities have, including San Francisco and Santa Ana.